Rare to find dinner plates in such good condition and getting hard to find. Colour - white inner rea with pink rose detail. Cobalt blue / gold / cream bands. A little clear glaze crazing - see photos. Underneath says on a coloured red / yellow backstamp. Design and Colour– detailed, shiny, clear and bright. Crown Ducal. Art Deco Ironstone China. 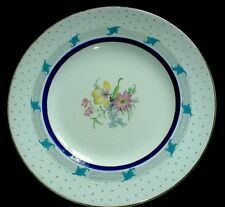 MATERIAL: Staffordshire Ironstone China. Plate, Dinner. COLOUR: White, Gold, Red, Orange, Yellow, Green, Cobalt Blue. Peaches and Berries, Blue and Gold Border. 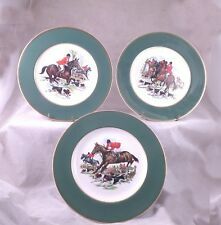 Crown Ducal Hunting plates DEESIDE 3 different in set. 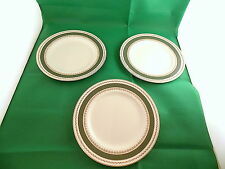 SET of Three Crown Ducal ! Each plate is decorated with a different. fox hunting scene inside a wide green border. The bases show the makers mark. I believe these to be seconds as the makers mark has a recessed dot on it. CROWN DUCAL. and clear glaze crazing - see photos . Colour - white background with grey stars, turquoise hand painted detail, cobalt blue band and central flower spray. Plate has a glazing fault 3 1/2 long on outer band - see photo 6. Poole Pottery Twintone Mushroom / Sepia Dinner Plates x 4 (#201614890509) £15.99 View Item. Spode Flemish Green Scroll Pattern Dinner Plates x 5 (#201594928433) £23.99 View Item. lydae09 ( 144. FABULOUS PLATES, CAN'T WAIT TO USE THEM, SO PRETTY! ). Very attractive dinner plate from Crown Ducal, Measuring 10 1/2" wide with no chips or cracks, all though it does show some crazing as I have tried to show in the close up, as well as some small glazing flaws to the cobalt blue. Please see my other items. 'Charming England'. Image of a crown. ALL DECORATION IS HAND. Very attractive dinner plate from Crown Ducal, Measuring 10 1/2" wide with no chips or cracks, all though it does show some crazing as I have tried to show in the close up. Please see my other items. CROWN DUCAL A G R STRAWBERRY FAIR DINNER PLATE . Dispatched with Royal Mail 2nd Class. Norvic Citrus. In the Norvic Citrus design. CROWN DUCAL. A lovely rown Ducal dinner plate in good condition. Dinner Plate. (there are alot of utensil marks to the plate). Sorry but I cannot accept foreign cheques/checks/money orders. Crown Ducal 6107 Filigree collection dinner plate. Beautiful Crown Ducal dinner plate from the Filigree collection. In burgundy, ivory snd gold. In excellent condition. I have other pieces from the same collection on separate listings. 1920s. Crown Ducal DINNER PLATE. Direct bank account to bank account transfer. You can arrange this online, by phone or in person with your bank. CHEQUE OR BANK DRAFT –. Makers Mark: Crown Ducal. Made in England. Wild Rose 5105. Pattern: Wild Roses. CROWN DUCAL.STRAWBERRY FAIR. X 2. 25.5 CM DINNER PLATES. THEY ARE IN PERFECT CONDITION UNLESS OTHERWISE STATED. Lovely plate by Crown Ducal. Has a old crack across it and marks where the wall hanger was attached. VERY COLLECTABLE AND RARE IN THE UK. FOR SALE CROWN DUCAL DINNER PLATE 1935-1938. Object Type Dinner Plate. This attractive pattern was produced by Crown Ducal and is now discontinued. It features multicolor flowers and fruits on cream. This dinner plate is previously owned and in great condition with little or no signs of use or wear. CROWN DUCAL. DECORATED WITH DEEP BAND OF RICH COBALT BLUE WITH GOLD GILDING DETAIL. LEMON BASE WITH A DELIGHTFUL PINK RED ROSE IN THE CENTRE. NO PATTERN NUMBER. DINNER PLATE. 10.5 DINNER PLATE. EXCELLENT CONDITION. Crown Ducal FLORENTINE OFF WHITE Large Dinner Plate 10.25" LIGHT USE from Dishfunctional. One (1) Large Dinner Plate by Crown Ducal. This elegant pattern was produced by Crown Ducal and is nowdiscontinued. 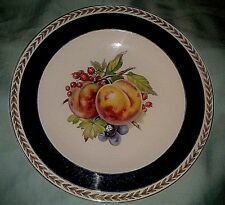 Crown Ducal CHARM 2 Large Dinner Plates VERY GOOD CONDITION from Dishfunctional. 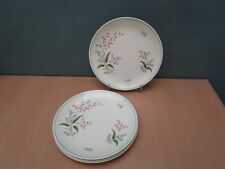 Two (2) Dinner Plates by Crown Ducal in the Charm pattern. This attractive pattern was produced by Crown Ducal and is now discontinued. Crown Ducal DINNER PLATE. Direct bank account to bank account transfer. You can arrange this online, by phone or in person with your bank. CHEQUE OR BANK DRAFT –. We cannot send goods until funds have cleared.